The answer is no. With all the eating they have to do, they just don't have the time! The name comes from their habit of swimming incredibly slowly right at the water's surface. They don't do it to catch some rays, it's for catching the tiny, planktonic creatures that make up their diet. 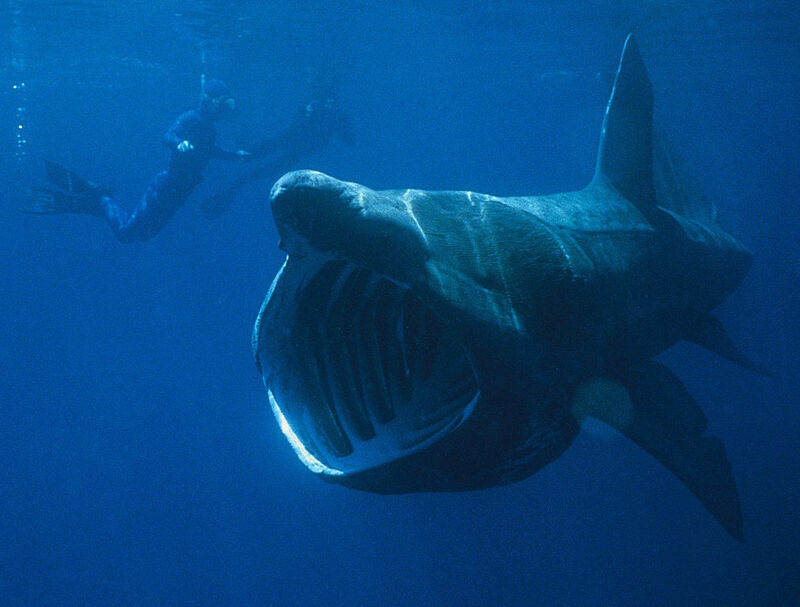 Basking Sharks are a million billion times bigger than the things they eat. This is not a precise calculation. In fact, it's not a calculation at all. It's just that Basking Sharks average around 6 to 8 metres (20 to 26 ft) long and 5 or 6 tons in weight. Others are bigger, with the biggest on record measuring some 12 metres (40 ft) and an estimated 20 tons. You know the powdery crumbs at the end of a box of breakfast cereal? They basically eat that. And they need lots of it! Their first tool is a cavernous, gigantisaurus mouth up to 1 metre (3 ft 3 in) across. In order to eat they must open wide and swim. Swim and swim and swim. Unlike their even bigger Whale Sharks cousins, Baskers are unable to stop and gulp down great mouthfuls of water along with small fish and squid and whatever else. Poor, old Basking Shark has to keep moving and gobble up those crumbs. Step two is the gills. These are covered in the gill rakers, bristles that strain out the plankton. In order to get enough food they need to have a lot of gill rakers, which means big gill slits, gill slits that almost entirely encircle their head. If they were any bigger, it's not clear that the head would actually remain attached! These adaptations mean that despite travelling at speeds of just 3.7 km/h (2.3 mph), a big one can filter through some 2,000 tons of water per hour. When the cookie crumbles, the Basking Shark just picks up those crumbs and makes a whole, new cookie! To find all this food Basking Sharks travel all over the place in search of plankton blooms. The weird thing is that they seem to have come to some agreement with Whale Sharks; remember how Whale Sharks lived in all the tropical and subtropical oceans around the world? 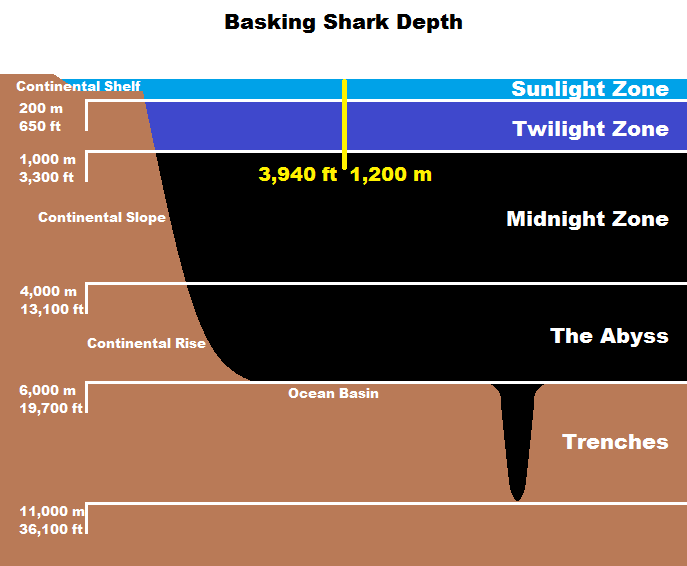 Well, Basking Sharks have taken up the rest, living in the cooler, temperate waters both north and south of the equator. It's so nice when sharks can get along! 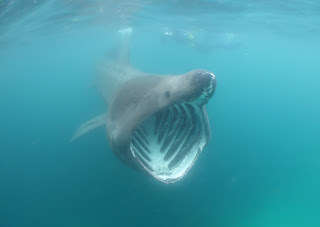 There was always this odd mystery, though: where do all the Basking Sharks go in the winter? They're often seen at the surface in the warmer months, but they almost entirely disappear when it gets too cold. their liver lost weight. It usually accounts for up to 25% of their entire bodyweight, but it seemed to be much lighter in spring. Perhaps it was being used an energy store for hibernation? It took satellite tagging in the early 2000s to shed some light on the issue. Basking Sharks don't hibernate, they remain as active and hungry as ever. They swam to depths of at least 900 metres (3,000 ft) and then migrated south for the winter! Some ended up all the way down in Florida, but one actually crossed the equator and spent a month near the Amazon in Brazil. Looks like the entente with the Whale Sharks allows the Baskers to travel right underneath them! It turns out that bits of those gill rakers are constantly falling out and being replaced, much like the teeth of less gentle sharks. As for the shrunken liver... perhaps the plankton down there simply isn't as good as the sun kissed stuff? Whatever the case, it's pretty remarkable that it took until the 3rd millennium to discover that the second biggest fish in the world doesn't hibernate! 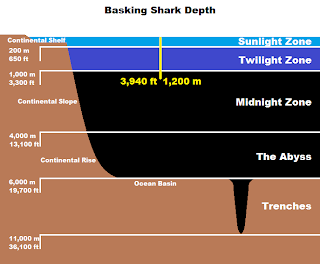 A later study watched a Basking Shark cross the Atlantic, reaching depths of just over 1,200 metres (3,940 ft). The whole world seems to be their oyster! It makes one wonder if this is a surface dwelling filter-feeding shark like the Whale Shark, but it dives to great depths for half the year, or is it more a deep sea filter-feeding shark like the Megamouth Shark, but it spends half the year at the surface? It seems that every patch of ocean has its own filter-feeding shark! Lucky ocean. With all this travelling up and down the world, it's no wonder that we know so little of their mating habits. You may well guess that reproduction is shrouded in yet more mystery. Only one pregnant Basking Shark has ever been caught. They are ovoviviparous, the eggs being retained and the unborn young possibly fed with loads of unfertilised eggs. This is a more traditionally sharky thing to do. Basking Sharks are usually seen alone but sometimes they can be in groups of several dozen. It looks like males and females don't consort with each other much, and perhaps spend most of the year miles apart. So that's a whole bunch of other stuff to find out! For me, the weirdest thing about Basking Sharks is the fact that they breach. This gigantic, slow-moving monster can leap right out of the sea and make an almighty splash! It may well be some kind of communication. It certainly communicates to me a reason to be cautious. Gentle giant they may be, but they are giant nonetheless. You don't want several tons of fish falling on your head. Old Basking Shark has enough crumbs to eat already. ooh, those mouths! yikes!!! ultra-creepy! @TexWisGirl: I know! It would take come work to convince yourself it's planning to eat you. @ Chloë Langley: I'm totally sure people are scared of those mouths! You almost imagine them screaming or bellowing or something, constantly. But then they can't eat, so it's mostly open. Lol, they are smiling so much when their mouth is closed! Yeh! It's another Sesame Street character! I enjoyed your guest post at Aha-now and this is spectacular. I love the sharks concept even though I have never seen sharks as friendly. Love the bloggers that you have mentioned even though some bloggers are new to me. Thanks for sharing.